MXI-Express x16 is based on PCI Express technology. A MXI-Express x16 kit uses PCI Express switches to enable control of a PXI Express or CompactPCI Express chassis from a PC with an available PCI Express slot. The PCI Express switch architecture is transparent to device drivers, so no additional software is needed to support using PXI Express and CompactPCI Express devices in a chassis connected using MXI-Express x16. The PXI Platform Services software on the PXI Platform Services CD or driver CD included with your PXI Express MXI-Express x16 hardware is required to provide chassis and controller identification for PXI features such as trigger routing and slot detection. The PXI Platform Services software also is included with the NI-DAQmx and NI-VISA drivers. For more information, refer to KnowledgeBase 3TJDOND8 at ni.com. The link between the PC and the chassis is a x16 PCI Express link. This link is a dual-simplex communication channel comprised of low-voltage, differentially driven signal pairs. The link can transmit at a rate of 8 Gbytes/s in each direction simultaneously, though protocol overhead and other inefficiencies reduce the achievable throughput. The following figure shows the basic architecture of MXI-Express x16. The PCIe-8388 consists of a PCI Express x16 board edge connector, PCI Express repeaters, and one cabled MXI-Express x16 connector. The PXIe-8388/9 consists of one or two cabled MXI-Express x16 connectors, a PCI Express switch, and PXI Express connectors. PCI Express x16 Board Edge Connector—You can use the board edge connector to use the PCIe-8388 in a x16 PCI Express slot in a PC. The PCI Express Card Electromechanical Specification defines this connector. PCI Express Switch—The PCI Express Base Specification defines a PCI Express switch as a logical collection of PCI Express-to-PCI Express bridge devices. PCIe-8388 does not contain a PCI Express switch. It uses PCI Express repeaters to drive the PCI Express signals over the PCI Express cable. The PCI Express switch is on the PXIe-8388/9 board. On the PXIe-8388/9, the switch upstream port is connected to the cable PORT 1. One downstream port is connected to the SMBus Master, one x16 port is connected to PORT 2 (PXIe-8389 only), and four x4 ports or one x8 and one x16 port are connected to the backplane, depending on the chassis backplane configuration. Cabled MXI-Express x16 Connector—The cabled MXI-Express x16 connector provides the transmit and receive signals to connect an PCIe-8388 and an PXIe-8388/9, plus some miscellaneous signals such as a clock and reset. 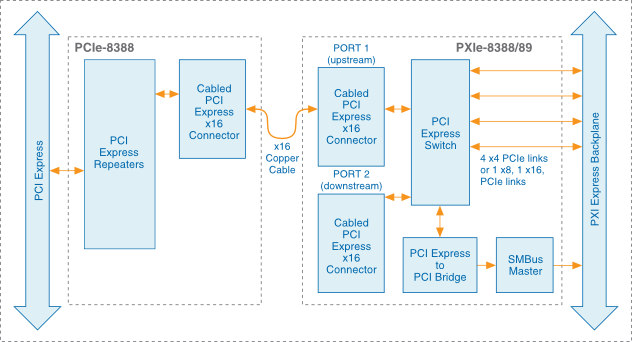 PCI Express-to-PCI Bridge—The PCI Express Base Specification defines a PCI Express-to-PCI bridge as a device that connects a PCI Express fabric and a PCI hierarchy. On the PXIe-8388/9, the PCI Express-to-PCI bridge connects the PCI Express switch and an SMBus Master on the board. SMBus Master—The SMBus is a low-speed bus for reading and configuring devices outside the normal PCI Express mechanism. The PXI Express specification requires controllers to supply an SMBus for reading chassis configuration information from an EPROM. You also can use it for fan control, power monitors, or other system devices. In addition, devices on plug-in boards may connect to the SMBus for purposes specific to those devices.